« #FEPEMilan More DOOH Metrics Needed? Costa Mesa, California-based Delphi Display Systems Inc., designer and manufacturer of reliable and rugged outdoor digital signage solutions, has introduced Endura, an Order Confirmation display technology for improving order accuracy and speed-of-service at drive-thru Quick Service Restaurants. Delpi says that Endura, named for its durability, offers the longest warranty available in the industry today. 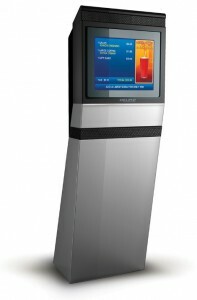 At the heart of the Endura product is a 15” LCD with a proprietary LED backlight system that is designed to last for 70,000 hours MTTH (Mean Time to Half-brightness) – representing eight years of continuous operation. This is believed to be the longest life backlight on the market today and 40% greater than the industry standard. In addition, the electronics and packaging have been redesigned to further improve reliability over ambient temperatures from -40°F to +140°F (-40°C to +60°C). Delphi is so confident in the reliability of its new Endura product line that it comes with a standard 5-Year warranty including Advanced Exchange service and free technical support. From the outside, Endura’s look is contemporary and sleek, comparable to a tablet computer display. Its high impact all-glass front window with black glass bezel makes Endura stand apart while protecting its internal components from vandalism. As a complementary offering, Delphi is also introducing a completely redesigned speaker post. The new post is streamlined and angled, which improves both the display’s design aesthetics and functionality and looks like nothing available on the market today. There are two versions of Endura available. Endura E-Net contains an embedded industrial computer and software that interfaces directly with the Point-of-Sale system and stores all content locally in flash memory. Endura V-Net uses Delphi’s proprietary VGA over CAT-5 transmission technology to transmit video over standard CAT-5 network cable over distances of up to 1000 feet – enabling the computer to be located in the store. This entry was posted on Monday, June 18th, 2012 at 09:34 @440 and is filed under Scuttlebut. You can follow any responses to this entry through the RSS 2.0 feed. You can leave a response, or trackback from your own site.